How is this possible? I would expect that if his ranking is sufficient to be seeded player in the main draw, it should also be sufficient to avoid qualifying. I suspect it might have something with him entering the tournament late? (See acceptance list on the same link. He list listed there among withdrawals.) But I do not know that much about the system how the players enter the tournaments; so I have decided to ask here. I wanted to come back and add an answer to this question because it happened again this week (27 Apr 2015) in a Challenger event in Tallahassee involving Facundo Bagnis of Argentina. You can find the draw for the 2015 event on their Facebook Page, or the Wikipedia page for it once it's updated. The reason for this happening is that Bagnis is currently ranked 90 in the world (pretty high for a Challenger event being played the same week as 3 ATP tour events also). The problem is, Bagnis didn't sign up to play the event in time, so he was forced to play qualifying in order to make his way into the main draw. THEN - the tournament organizers didn't make up the draw (and thus, the seeds) until AFTER qualifying had completed - therefore allowing them to give Bagnis the #1 seed (appropriately) but he still has the "Q" by his name, since he made the main draw as a qualifier. According to some sources that follow pro tennis closely, this happens fairly regularly at the Futures level, but rarely in Challenger level tournaments. Glad to have finally got an answer to this question! 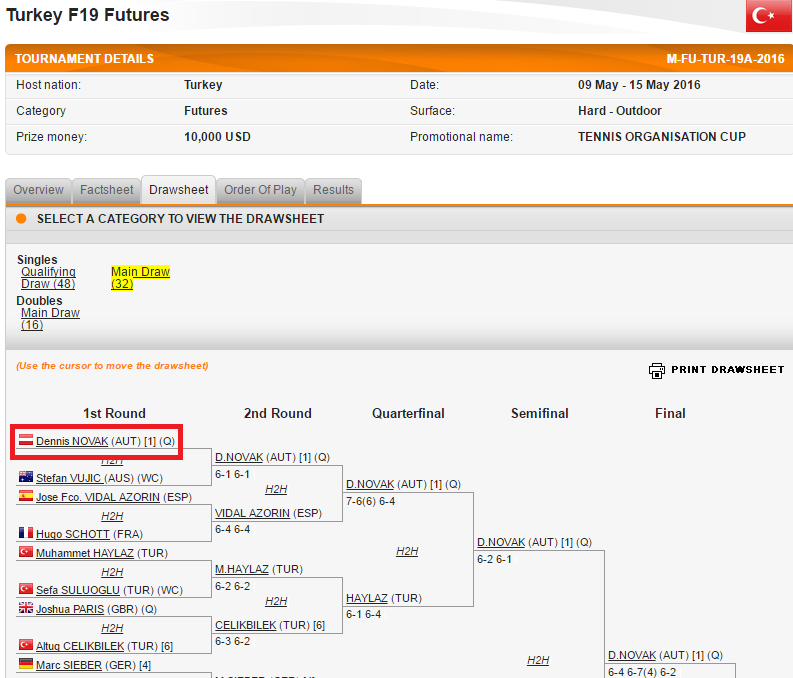 If it is Karol Beck from Slovakia that you are refering to I am unable to see that he Played in the qualifying rounds. 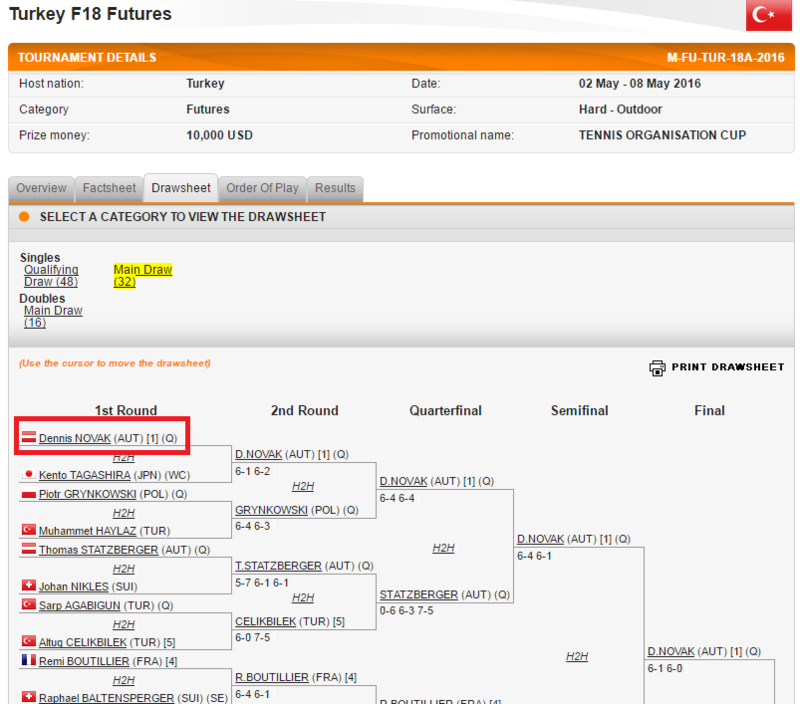 According to his playing stats on http://www.itftennis.com/procircuit/players/player/profile.aspx?PlayerID=30017696 it shows that he has played in the last 32, 16 and is now facing Marek Semjan in the Quarter Finals. I would like to add some more insights to the answer that was already given. 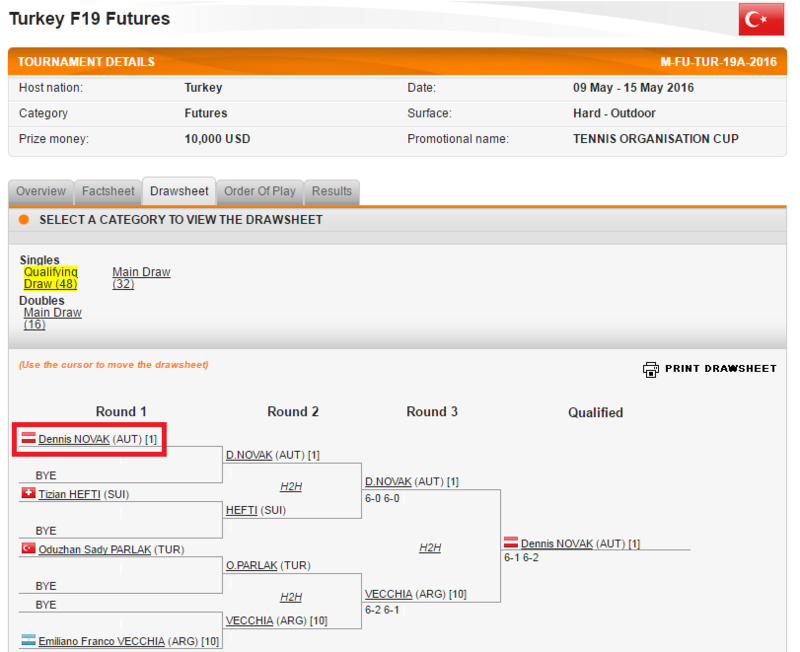 First, I would like to mention that forgetting to sign in for a tournament on-time is only one reason for top seeds (in the main draw) who play qualifications. There is also another reason: Players sometimes do this on purpose if they want to gain match practice, that is, they want to play as many matches as possible. For example, in 2016 Dennis Novak played 4 Futures (more or less) back to back and in each he played qualifications, despite the fact that he would have been top seed in the main draw. I think the excuse that he didn't sign up in time, is not valid in this case. 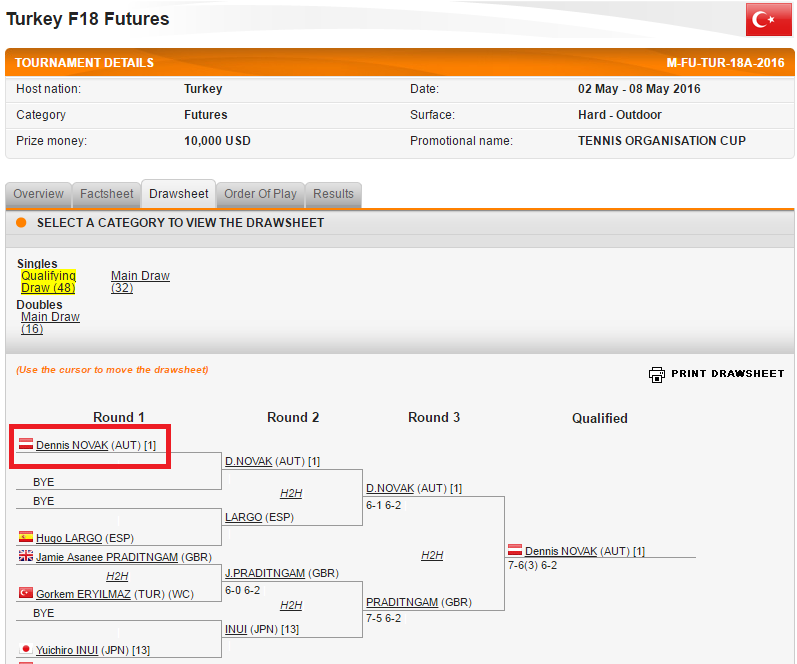 I would also like to stress, that only in Tunisia F14 Futures, Dennis received a Wild Card into the qualifications. For all three other tournaments he entered as a normal player (without a Wild Card). I am not sure why he needed (?) 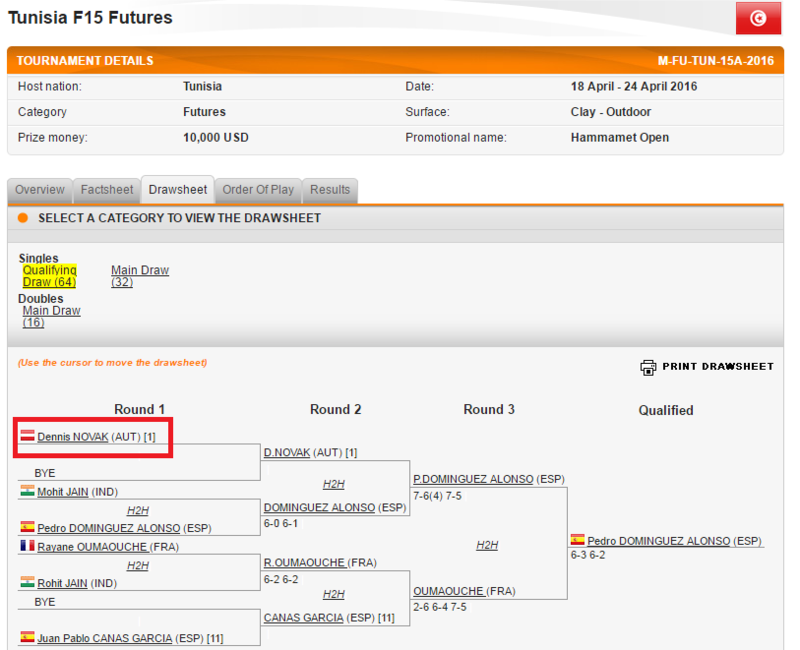 a Wild Card to play the qualies of Tunisia F14 Futures, because there is also the option to be on-site at the qualifications deadline. In that case (irrespective of your ranking) you can play qualies. After reading the rulebook section regarding entrance into qualifying draws, I am pretty sure that entering via Wild Card is done, when there is the possibility that the Qualifying Draw will be full with regular players. 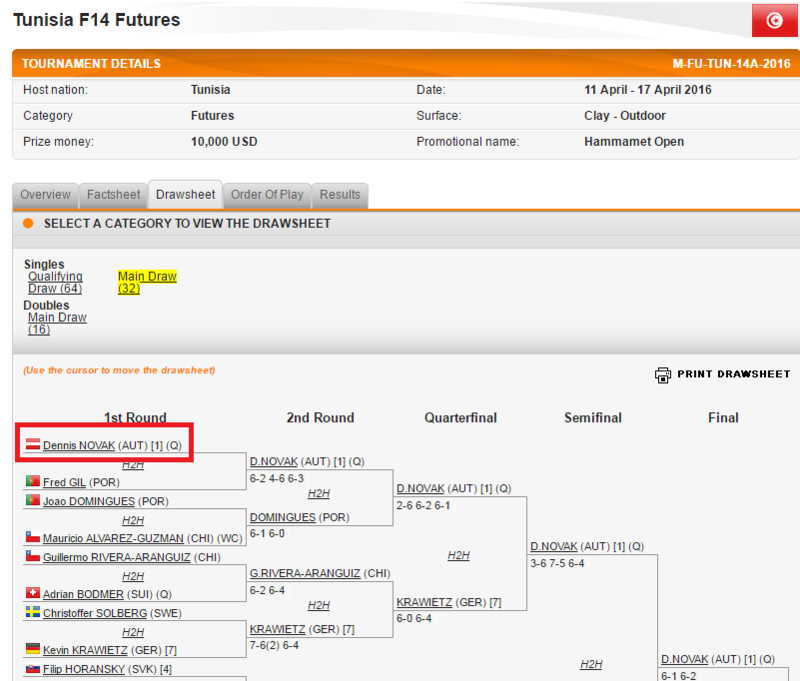 In this case, a top seed player, who wants to play qualificiations, can only play qualifications with a Wild Card. If the player can be 100% sure that the qualifications draw will NOT be full, he does not need a Wild Card and can enter the qualifications draw as a so called On-Site Alternate. Another thing I would like to note is that usually, if a top-seed, who would be (top) seeded in the main draw, plays qualies, the Main Draw is not made until the qualies are finished. 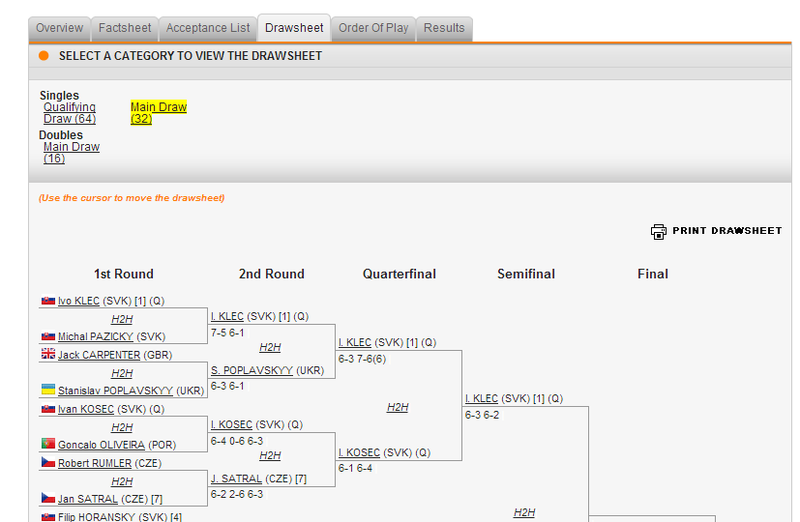 The reason for this is, that the top-seeded qualies player will then be also the top seed in the main draw. 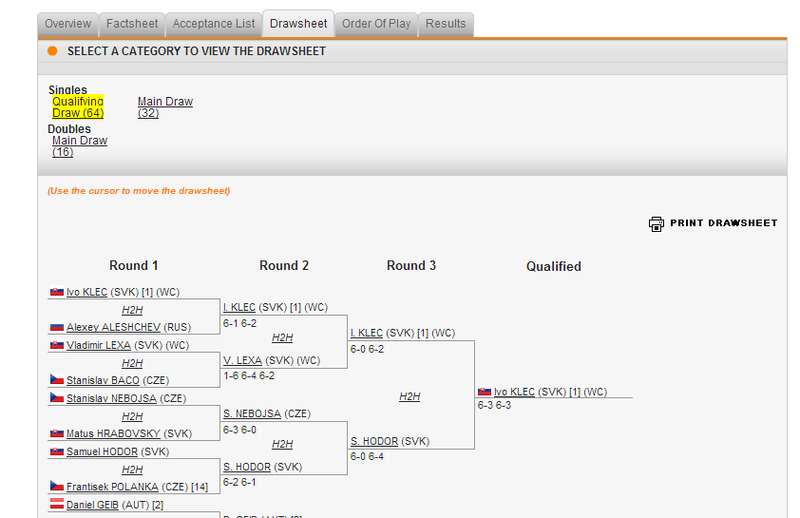 However sometimes, the Main Draw is already made before the qualifications are finished. In this case, the person, who would have been the top seed in the main draw, if the organizers would have waited until the qualifications are finished, will just be a regular qualifier. There is a valid chance, that this regular qualifier will play a seed in the first round of the tournament (which is stupid, if you ask me). 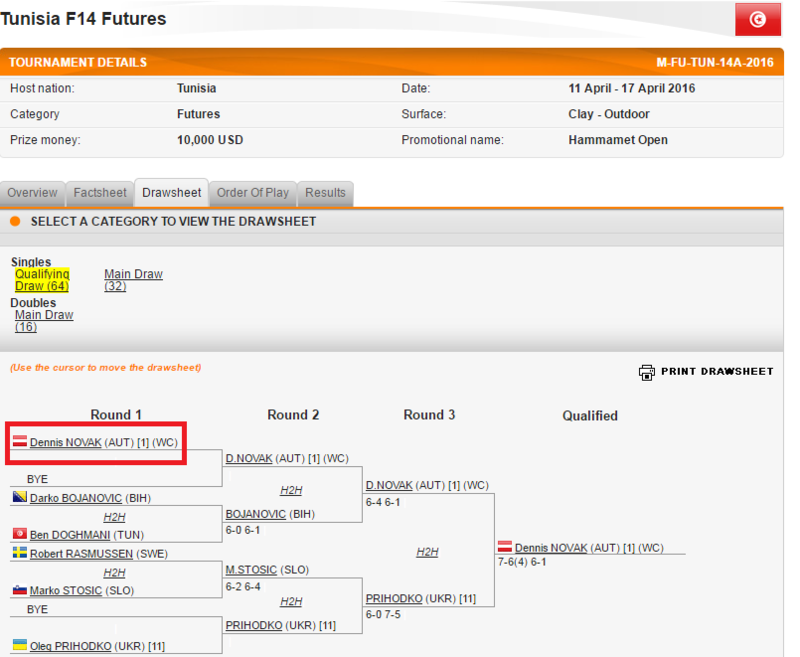 This case will likely happen this week in the Italy F9 Futures (draw), where Stefanos Tsitsipas (ATP #198) is currently playing qualies, but the Main Draw has already been made. Let's see who he will face in the Main Draw (if he successfully qualifies).